Put the sugar in a pan with 450ml (3/4 pint) water. Add the cinnamon stick, juniper berries, nutmeg, one orange slice and the lemon slices. Heat gently to dissolve the sugar. Bring to the boil, then turn off the heat and stand for 10min to allow everything to infuse. 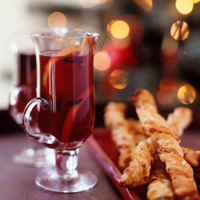 Add the liqueur and red wine and heat through gently, then pour into a jug. Add the remaining orange slices and serve.